4 July 2017 Note: Updated with new screenshots and BootMapperClient version 0.9.0. 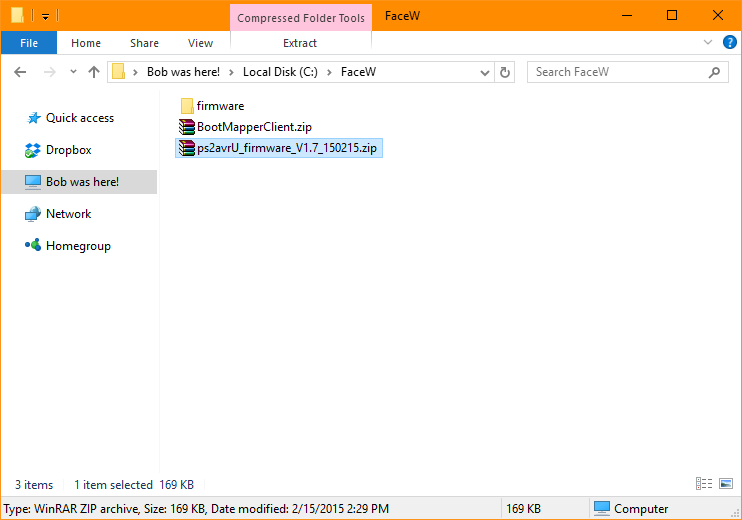 The faceW will work with ps2avrGB firmware but you will lose the use of the ps2avrU Menu and I couldn't get some of my macros to work so I decided to stick with ps2avrU Firmware V1.7 (15 Feb 2015). So, you've got your 60% FaceW! Congrats! Well, this unofficial manual hopes to shed some light on that. I've created this from reading through http://winkeyless.kr/ translated into English in Chrome, bugging sprit, and trial and error (FN + other keys in Aqua Key Test hahaha). Thanks to zennasyndroxx for pointing me to the keycodes for use with the ps2avrU Menu! If you have questions or have something to share, let me know! These are the default layers and the same as the ones from the file "keymap_part(thumb)(face)(XTen).hex". 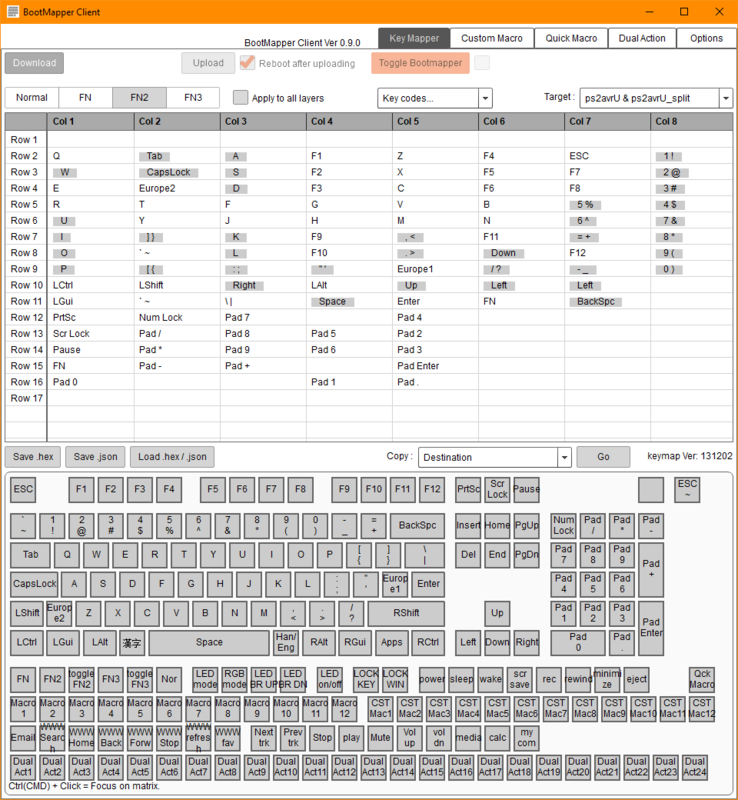 NOTE This file contains additional keymaps for the XTen but the FaceW does not have the additional rows/columns. Why is the Caps Lock LED not illuminated? The LED on the Caps Lock is the Caps Lock Indicator. It will illuminate only when Caps Lock is on. Why is the Back Space LED not illuminated? The LED on the Back Space is the Num Lock Indicator. It will illuminate only when Num Lock is on. 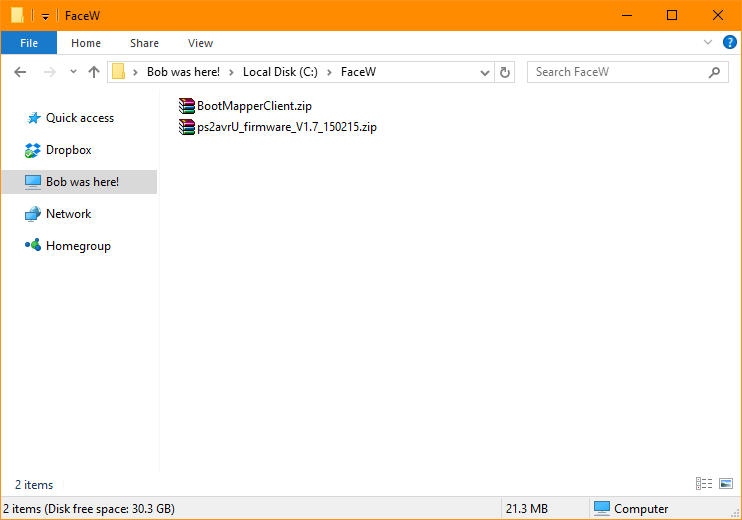 (Optional) Step 0: Put your FaceW in Boot Mapper Mode. Why is this optional? This is optional because instead of clicking the cell in the table indicating the key you want to map in Step 6, you need to press the key on the keyboard and the cell in the table will be selected for you. You must still select the proper layer though. NOTE While in Boot Mapper Mode, each keypress will output text identifying the column and row (e.g. -6,1=). This how the Boot Mapper Client picks up which key you press. Hold down the Tab key while plugging the USB cable. The Caps Lock LED will now be flashing slowly. The keyboard is now in Boot Mapper Mode. Method B -- This is longer but you don't need to unplug the USB cable. Press and hold Left Control, Left Alt, Left Shift, and Right Shift for five (5) seconds. The Caps Lock LED and the Num Lock LED will flash three (3) times quickly. Release the keys the keys you are holding down. 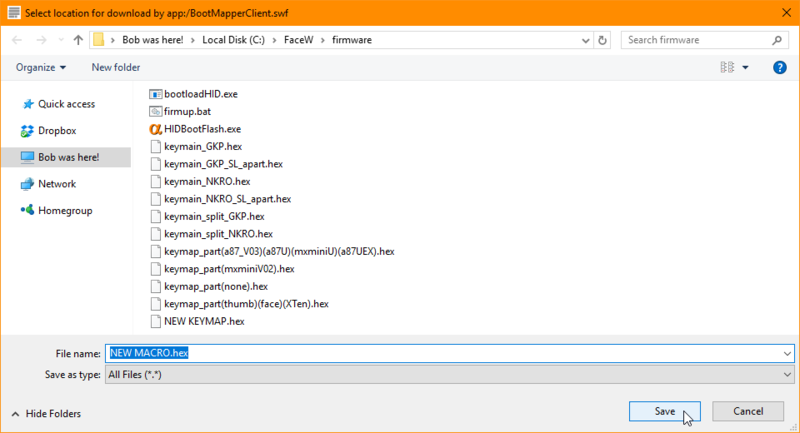 Step 4: Double click on BootMapperClient.exe in the BootMapperClient folder. Step 5: Click the target dropdown menu in the upper right and select "ps2avrU & ps2avrU_split". Step 6: Click "Load .hex / .json". 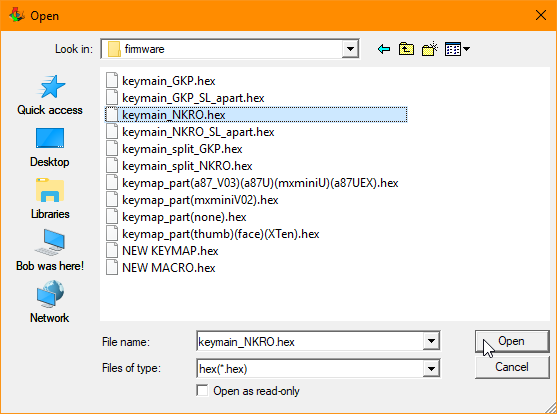 Step 7: Navigate to the firmware folder and open the file "keymap_part(thumb)(face)(XTen).hex". Step 8: Once the keymap file is open, you will see the Normal Layer. Now lets make some changes! Step 9: Go to the layer you want to edit (fn3 in the example below). We will remap Space. If you performed Step 0 and put your keyboard in Boot Mapper Mode, press the Space Bar on your keyboard. Alternately, you can click the cell in the table indicating "Space". Step 10: Click the new key you want to assign (toggle FN2 in the example below). 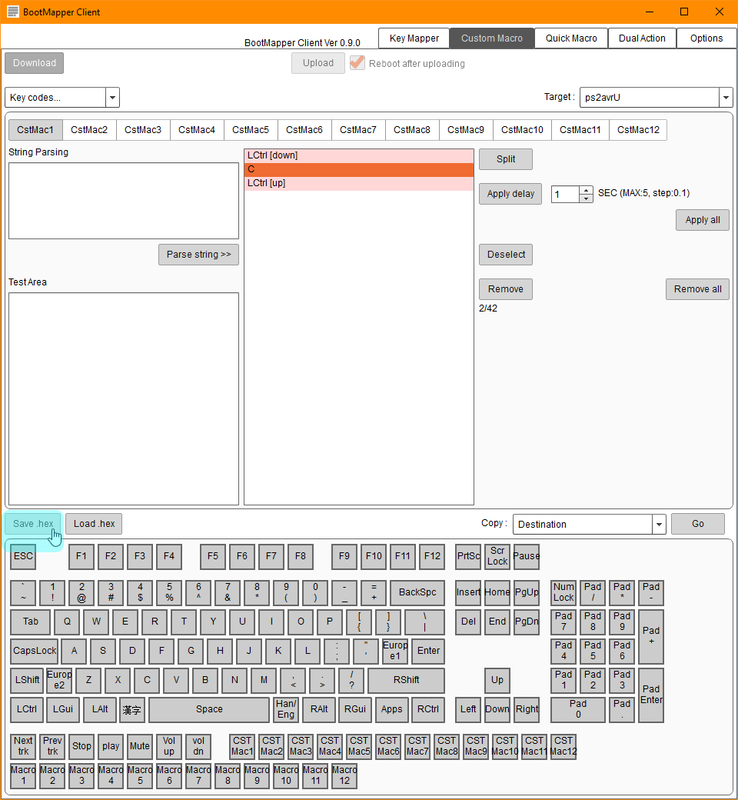 Step 11: When you are done customizing the keymap, click "Save .hex". Step 12: Give it a memorable file name (I chose NEW KEYMAP.hex ) and click "Save". Step 13: If applicable, exit Boot Mapper Mode by unplugging and replugging the USB cable. Step 14: Now to flash the keymap file! DISCLAIMER: Flashing can cause permanent damage to your keyboard if applied incorrectly. In no event will I and / or GeekHack be liable for any damages of any kind relating to this guide, including but not limited to, compensatory damages, lost profits, lost data or any form of special, incidental, indirect, consequential or punitive damages of any kind whether based on breach of contract or warranty, negligence, product liability or any other theory of liability. Step 4: Put your FaceW in Flash Programming Mode. Hold down the Q key while plugging the USB cable. Note: Try not to stare at it for too long. 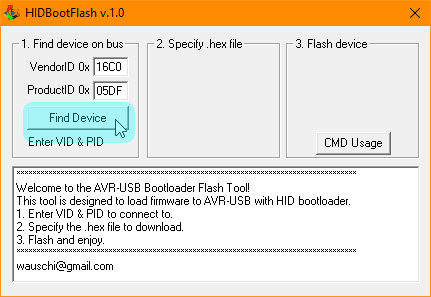 Step 5: In HIDBootFlash, click "Find Device". Step 6: If the device is found, the "Open. hex File" button should appear. Click it. 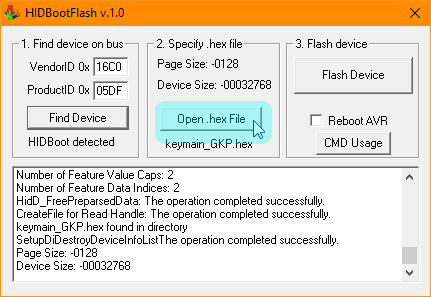 Step 7: Now select the firmware file, keymap file, or macro file that you want to flash and click "Open" (I'm using the main firmware file keymain_NKRO.hex). 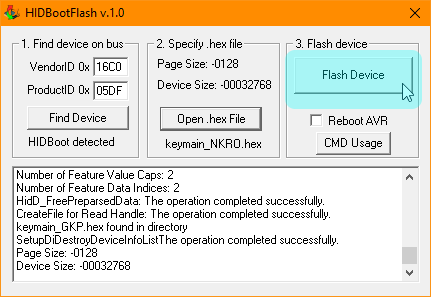 Step 8: Click "Flash Device". Note: While it is flashing, the LEDs will be steady. When done, the LEDs will return to flashing. Step 9: When you see ":-) Finished flashing the device!" in the console area, you're done! Disconnect and reconnect the usb cable. 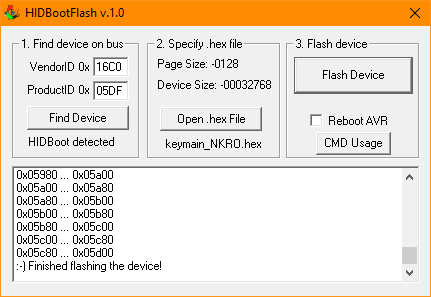 It would be best to flash in this order: firmware >> keymap >> macro. If you would like to continue flashing other files, don't disconnect the USB cable, and instead go back to Step 6. Step 10: Enjoy your new firmware / keymap / macros! In the ps2avrU Menu, you can change settings and program the keymap and macro with keycodes. Press FN and 1, the keyboard will register F1. While holding down 1, release FN and the keyboard will register 1. While still holding down 1, press 2 the keyboard will register 1 and 2. Press FN and 1, the keyboard will register F1. While holding down 1, release FN and the keyboard will still register F1 as if FN was still pressed. While still holding down 1, press 2 the keyboard will register F1 and F2. So it's like a "sticky fn" or something. For what it's worth, turning Lazy FN on has eliminated the unintentional [ / ; ' I leave all over the place while using them as arrows and release the FN early. Step 1: Enter the ps2avrU menu. Step 5: You're done! Enjoy Lazy FN! 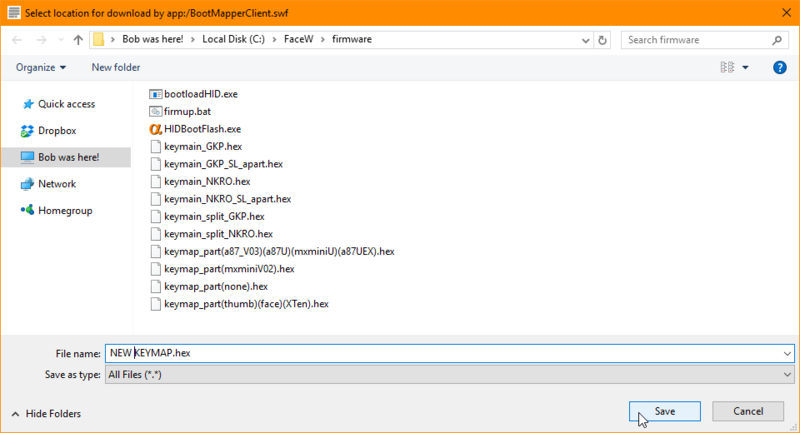 Step 3: Double click on BootMapperClient.exe in the BootMapperClient folder. Step 4: Click "Custom Macro". Step 5: Click the target dropdown menu in the upper right and select "ps2avrU". Step 6: Click the custom macro you want to program (CstMac1 in this example). Step 7: Program the Macro. In this example, we will program CstMac1 for a copy command using Left Control + C. Now click "LCtrl" and "C". Now there is a "LCtrl" and "C" in the programming window. If left this way, the macro will output a "LCtrl" keypress and then a "C" keypress. We want "C" to be pressed while "LCtrl" is being pressed. To do this, we need to split the LCtrl. When you split a key press, you separate its "Down" (key is pressed down" and its "Up" (key is released). 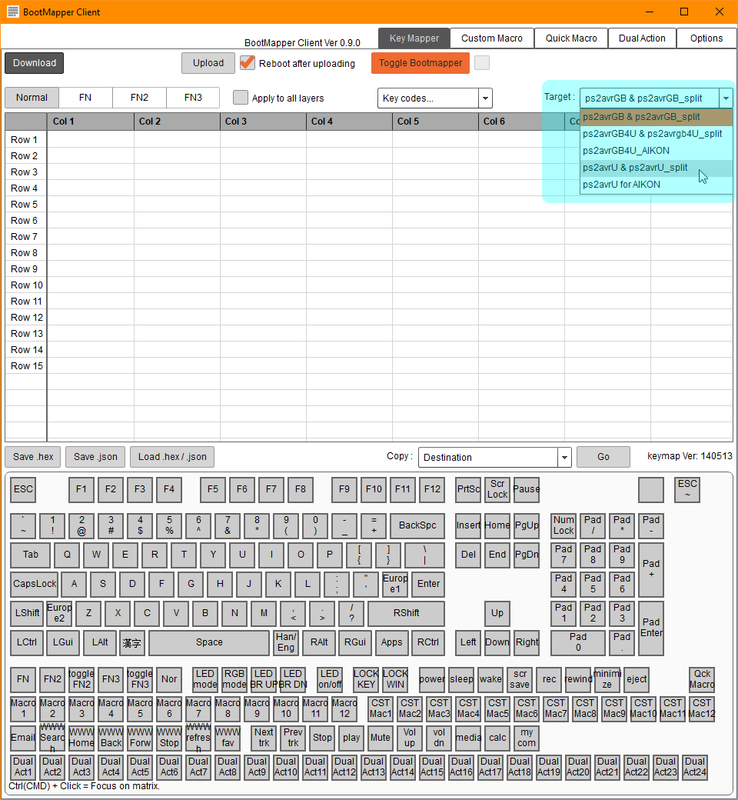 Step 8: Select the key you want to split (in the example below, we are splitting LCtrl) and click "split". Now that LCtrl has been split we need to move "C" in between the "LCtrl (down)" and "LCtrl (up)". Step 9: Click "C" in the programming window and drag "C" in between "LCtrl (down)" and "LCtrl (up)". Now you are done programming CstMac1! Step 10: When you are done programming the macros, click "save macro.hex". Step 11: Give it a memorable file name (I chose NEW MACRO.hex ) and click "Save". Step 12: Now to flash the keymap file! Note: Don't forget to program the CSTMac1, CSTMac2, ... , CSTMac12 buttons in your keymap! cool... Looking forward to this. Ok so this is almost done. All that is left to do is make the images for the default layers and explain how the FN3 layers works. Thanks infiniti for the detailed guide/manual! Release FN while holding down 1, the keyboard will register 1. Release FN while holding down 1 and then press 2, the keyboard will register 1 and 2. Release FN while holding down 1, the keyboard will register F1. Release FN while holding down 1 and then press 2, the keyboard will register F1 and F2. did you mean PRESS and RELEASE on FN here? Good eye! I'll fix that. Edit: Fixed the Lazy FN description. Think of it as "sticky fn"
Are these firmware files still necessary? 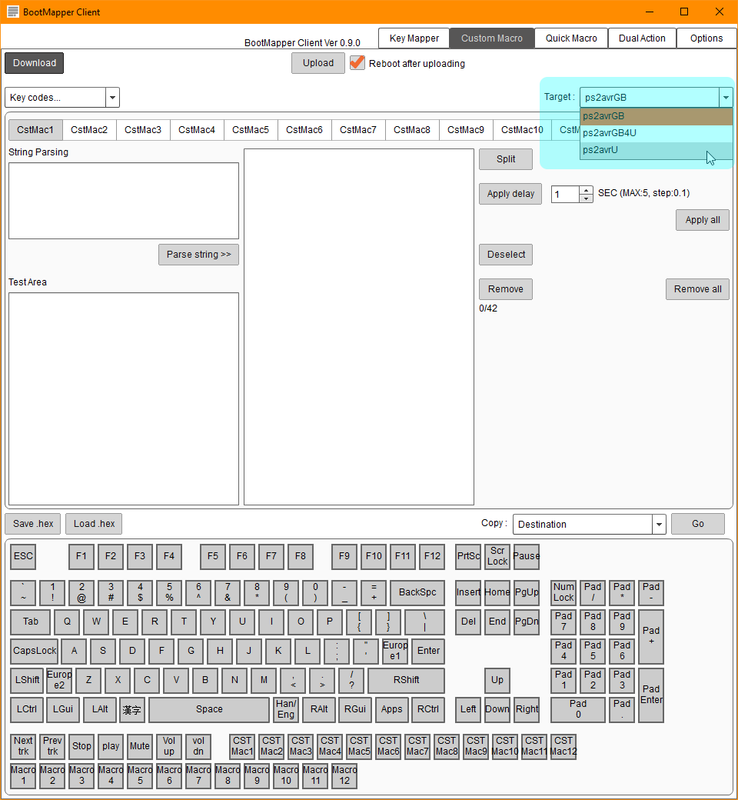 The "Apps" key on the default layout on the first layer. Is that a win key or a contextual menu key? 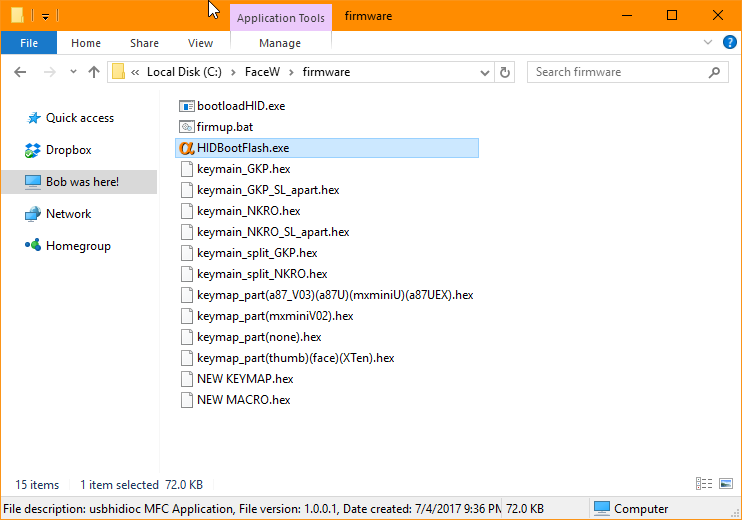 Yeah, those are the firmware and key map files. This is written for V1.6. I should mention that in the OP and attach files. Also, there are minor changes in V1.7 like the options in the Hardware Key Mapping Mode. I'll write that up later this week. It's a contextual menu key. This is great. I've been looking for an English version of this for a while now. Really Nice User made Guide !! Thanks for Your comment! HPE1000 ! Thanks sprit! I know you're busy working hard on preparing and shipping R1 so I decided to help you out. Thanks for that HPE1000! P.S. I did not know that that was an HHKB arrow cluster...now all those pics with novelties in that position make more sense! Ye! It has Arrow keys in the FN2 layer for default Keymap! Personally, I prefer the Arrow Keys in the Normal Layer (like Happy Hacking, or might 1800) or, in Fn 1 Layer (as Poker 60%) in the 60% mini keybards. LED Brightness Keys can go to Fn + V (B) as the Poker I, II. In any Case, You can custom Your own Key easily with the Boot(Key)Mapper Software. Thank you for sharing this is information is very handy. Just wondering if its possible for me to swap the position of the fn and apps key ? refer to this spreadsheet for the keycodes. Maybe I'll put up a guide or something someday. Yes you can! Just tried it out. Just be sure to change it on all the proper layers. For me, the easiest way is to use the GUI (http://boot.winkeyless.kr/bootMapper/) and with your FaceW in Boot Mapper GUI mode so that when you press a key on the keyboard the proper cell in the table will be selected for you (just pick the proper layer). Hold down the Tab key while plugging the USB cable. The Caps Lock LED will now be flashing. Col6, Row11 is the FN key to the right of a 1.75x R.Shift. I've been spoiled with the GUI that I never tried the ps2avrU programmer. I'll try soontm. Thank you ! I'm a little new to all of these. So I'm gonna re-read it slowly before doing it. Afraid that I will messed things up. 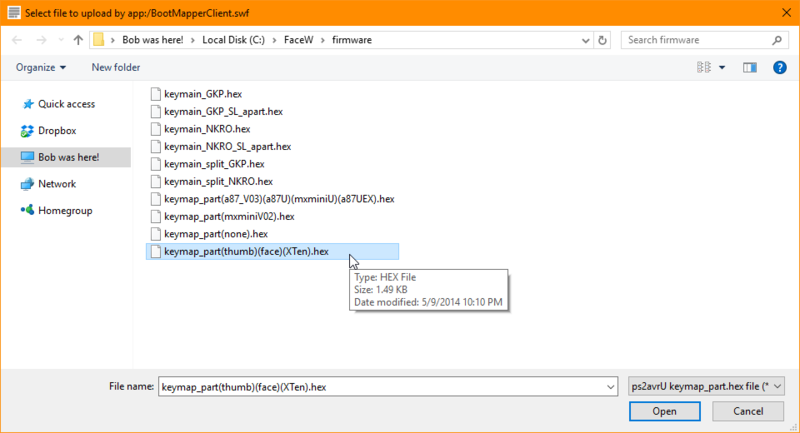 Regarding loading the hex file, I only have this "keymap_part(thumb)(face)(XTen).hex" instead of this "keymap_part(thumb)(face).hex"
It looks like the new keymap file is keymap_part(thumb)(face)(XTen).hex in the July 16 Firmware v1.7. Time to update this guide! Ah. Does that mean all the pcb's are currently at 1.6 or 1.7 ? Now updated for Firmware V1.7 (16 Jul 2014)! Yeah, I believe R1 shipped with V1.6. Hi infiniti, what OS are you using? I am trying to use the multimedia keys in mac os but got no luck. Any ideas? Superb manual by the way. I'm on win7 but have a hackintosh installation. I'll do some testing and let you know. Probably going to use the keycodes and the ps2avru menu since I don't think the flasher works on OSX. You should be able to compile bootloadhid on OSX. It's not a pretty gui, but it should allow you to flash in OSX. I'll update mine in awhile then. Just wondering if anything might go wrong if we update to 1.7 even if we're at 1.7 ? Nothing wrong with reflashing 1.7 with 1.7. It's like rewriting. Can't blame him. Sprit has his work cut out for him with this GB and all the hand soldering in R1. Just an update on my issue: There are times it work, but when I try to pull out the keyboard, the media keys wont work again. I am not sure how to enable it again. anyone having the same problem or just me ? Whoa dropped the ball on testing when my DSL went down. Same problem here. I asked sprit for help already. Let you know if I get word. It's down but there's an application you can download (http://winkeyless.kr/155). Please see below. I'll test it out later when I get home. The state is not available due to mechanical problems bootmapper site's hosting company server. 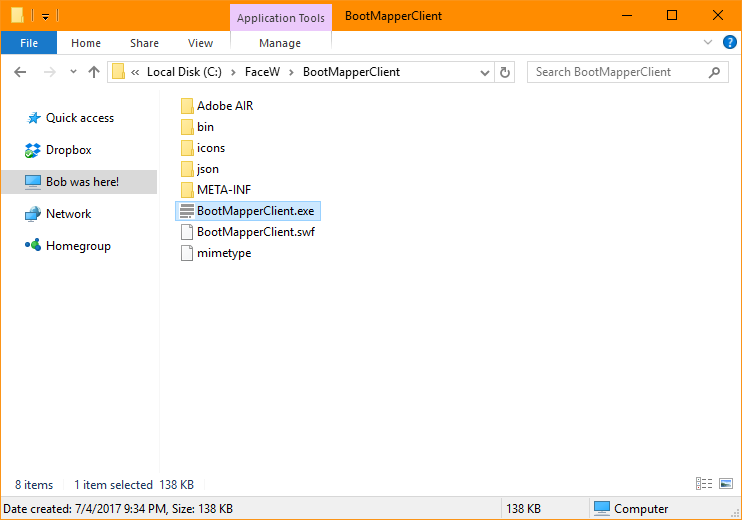 Instead, you can use the same applications bootmapper client to download the. Please use the links above to download the file. anyone have any idea whether will the gui tool works with windows 8.1? I'm not sure. I'm still on Windows 7 x64. @jorgenslee: I haven't tested that thing on the hackintosh installation. 'keep getting a kernel panic on startup. I'm on 8.1 and it didn't really turn out well. I'm not sure if it's because of my faceu replica that I bought if in a Chinese forum groupbuy or it just won't work. The vid and pid is different, loading bootloader with teh q key didn't work. Entered boot mapper via ps2avr menu didn't work as well. Page created in 0.17 seconds with 73 queries.